Creating characters is by far my favourite part of the writing process. It gives you an idea of what it must be like to be God, as you mould your characters into what ever images you choose. As you add quirky little details to them, like the funny way they hold their cup, or their hatred of tapas, they start to come to life. You feel as close to them as you do to your friends and family. I wanted to give my Facebook followers that feeling of satisfaction – and of almighty power. I asked them to create a character based on this picture. They really are a marvellously inventive bunch, my followers. My humble thanks to them for the three character sketches the follow. Wibert is 78 and three quarters. He is highly intelligent. He lives in a crumbling house in Navan, Co. Meath, Ireland. He has chosen it for its isolated location, which allows him to conduct his intelligence work in peace. He has been able to prove that the Higgs Boson particle is a scam and he is part of a dangerous sect, notable by the three spots tattooed into their foreheads. There are very few members left, because they observed strict celibacy. In spite of appearances, Boris Amstruther is quite a goer. He is 60 years old and lives in a rundown log cabin. He spends his time rescuing distressed hamsters and guinea pigs which live in the forests around his cabin. Once a year, he goes to the isle of Man, where he races in TT rallies. The only thing he eats is Bovril. Lawson Farge once stuffed black puddings and sausages in a factory. At night, he still dreams of sausages, and those dreams horrify him so much that he has turned vegetarian. He lives alone by a disused rail track. Recently, he converted to Catholicism and his new faith gives him comfort. He can see into the future and isn’t very happy about it. 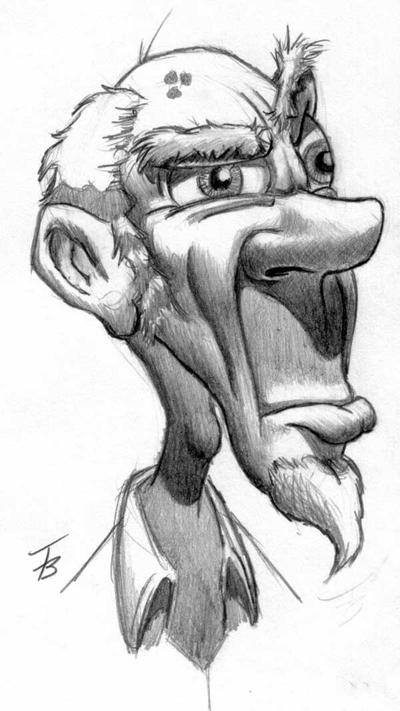 Would you like to create your own character sketch, based on this picture? Every time I put up a post on Facebook or Twitter about buzzwords that annoy people, I get a huge reaction. People are delighted to have an opportunity to rant about phrases like “going forward,” “blue-sky thinking” and “no problem.” I tried twisting people’s minds recently by asking them to come up with buzzwords which actually don’t annoy them. But the mere mention of buzzwords was enough to get their dander up. Why should they be so annoyed? They’re only words. But every time we choose a word, we’re tapping into an emotion. And when people hear buzzwords, they feel they’re being lied to, or that their concerns are being brushed aside. The worst thing about buzzwords is that they are used to give the impression of sincerity, while being completely insincere. If you were to strip the statements of politicians of all buzzwords, you’d find nothing there. Buzzwords allow politicians to say nothing while appearing to say something. They’ll start an interview with a journalist by saying “I’m glad you asked me that,” then completely avoid it, using a string of carefully crafted buzzwords. They can cleverly sidestep questions, avoid admitting errors and doge out of making promises to take concrete action. Buzzwords like, “Bear with me” and “No problem” are also much beloved by customer service representatives at call centres. They give callers the impression the rep will take action on behalf and sort out the problem. But people just feel they’re being fobbed off when they hear phrases like that. They’d rather their query was dealt with promptly and efficiently. Even in our own conversations, we tend to rely on buzzwords to get our message across. People on the UK and Irish side of the pond have become fond of Americanisms like “my bad,” which aside from being hideously ungrammatical, doesn’t come across as a real apology. When Irish and British people use Americanisms, it can give the impression that they’re trying a bit too hard to be cool. What’s wrong with our own slang, I find myself thinking when I hear them. What bothers you about buzzwords? Do you find them insincere? Or do you rely on them from time to time? I was once a journalist. Now I’m more or less not. It’s because I realised that journalism is not as compatible with writing as we’re led to believe. Still, the skills I learned as a journalist have been hugely helpful in my writing. Here are a few of lessons that our friends from the media can teach us. Journalists are experts at identifying an angle, an ingredient that makes a story stand out. Before you write a story, you need to figure out what to say with that story. The angle you choose will be your guide rope, preventing you from drowning in your story. Journalists have be able to make their points using as few words as possible – space is at a premium and their audience’s attention span is short. They quickly learn to spot words and sentences that are surplus to requirements. When you’re editing your work, see if you can cut down the length of your sentences, or if the sentence needs to be there at all. You’ll soon start to see the dead wood in your writing. Journalists can’t sit around waiting for the right words to come along. They have a deadline to meet, so they can’t afford to be afraid of the blank page. They just put in the yards. You can bring that same discipline to your own writing. Write every day, regardless of whether you have an idea or not. To paraphrase Picasso, when inspiration strikes, it’ll find you working. In the 15th century, there were 50 different ways to spell church. People wrote words down as they heard them, and they heard them in a multitude of different ways. So why are grammar Nazis getting in a twist about how words are being spelt on Facebook and in text messages? We’ve all grown up in a world of print. The arrival of print in the 16th century brought huge changes to the language. For the first time, there had to be agreement on how words were spelt, so they could be typeset with the minimum of fuss and expense. This was nothing short of a revolution, which gave birth to the written language we use today. Now the language is going through the same seismic shift it went through 500 years ago. It’s changing to adapt itself to new mediums: the Internet and mobile phones. Wading through large blocks of text isn’t practical on a screen; it tires you out. And you also have less space to say what you need to say. So the language is adapting, with shortened words and acronyms. It’s the arrival of so-called Netspeak that has the Grammar Nazis in a twist. Changes in language have always got people hot and bothered. People have always been concerned that grammar is going down the drain. This desire to control the language reached its zenith in the 18th century, when the first dictionaries and grammar books appeared. A lot of those iron-hard rules have gone by the wayside, because people realised they made the language too stuffy and rigid for everyday use. With the relaxing of these rules, written material has become more accessible. The problem is that when you transplant Netspeak from computers and mobile phones to the printed page, it looks horrible and it makes no sense. As long as our schools and institutions are living in the 20th century, we’ll still need to adhere to the rules of printed English, which is no harm, because it gives the language an anchor. I’m as much of a spelling Nazi as anyone, but I think it’s time to stop panicking about the relaxing of grammar rules and the arrival of Netspeak. These new means of communicating are allowing people to be wonderfully inventive with language. 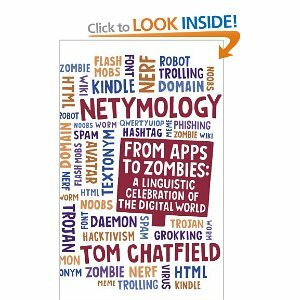 You’ll see examples of this when you read Netymology: From Apps to Zombies by Tom Chatfield, a chronicle of Internet-inspired words. And some of these words are older than you think! The English language is wonderfully complex. That’s why it requires wonderfully complex words to describe how it works. For this week’s blog, I’ve turned the spotlight on five words that describe the quirky ways we use the language. It’s fitting that these words are quirky in themselves. And here they are, these weird and wonderful words. No, it’s not a type of undergarment. 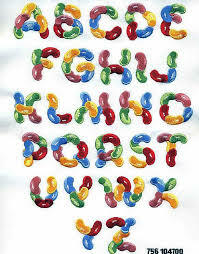 It’s a string of vowel sounds that are pronounced as one syllable, words like boil or ear. It’s characterised by the fact that your tongue moves up and down as you pronounce them, even though it comes out as a unified sound. It comes from the Greek dipthongos, sound. An oxymoron is not a remarkably stupid bull. It’s a pair of words that contradict each other. We use the phrase ‘living death’ to describe people with Alzheimer’s. When we argue, we agree to disagree. Even the origin of oxymoron is a contradiction in terms. It comes from a mix of Latin and Greek: oxus, meaning sharp, and moros, meaning stupid. Plosive sounds are satisfying to make. They’re your Bs and your Ps. Your mouth sounds as if it is exploding a little as you say them. The sound is created by an abrupt stop, when your mouth snaps shut as you make it. It comes from the French explosive. Ironic that the word plosive itself creates an explosive sound. Can you think of similar quirky words about words? Or examples of the words I have described?